I was thinking of Confit of Duck, as you do, as I had a couple of duck legs planned for dinner. 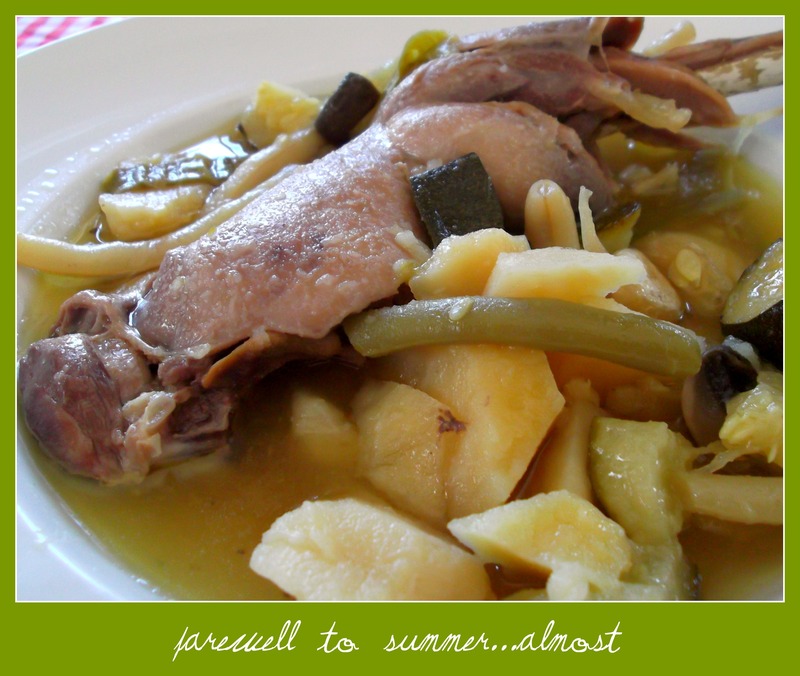 Of course, all the decent recipes wanted really long slow cooking, preferably a day or so in advance. I also didn’t have any duck fat to hand so had to think of an alternative. An “aha” moment came to me, not the Norwegian band from the 1980s you understand, although they did have their charm, but a turning on of a little light deep within the little grey cells. Patatas a lo Pobre, poor man’s potatoes. They are slow cooked in olive oil so there was no reason why the same process couldn’t work for my duck legs. For those of you who are now digging deep within their own little grey cells to think of an A-ha song, here’s one to hum along to. Now, back to the cooking. Pour the oil and wine over the potatoes, onions, garlic and peppers, season and mix. Place the potato mix into the bottom of an ovenproof dish then place the seasoned duck legs on top. Cover with foil and put into the oven for about 3 hours. When the juices of the duck legs runs clear, remove the foil and turn the oven up to the highest setting, remove the foil, drain off any liquid and cook for a further 20 minutes or until the duck legs are browned and the potatoes and peppers start to char. Leave to stand for 5 minutes before tucking into meltingly tender duck and potatoes. Fight using your fork with your loved one for any crispy bits in the pot. If you fancy an oriental influenced duck dish, take a look here. I’m surprised I don’t post more cod recipes, considering how much of it we eat. Typically here it’s salt cod, but sometimes we can now get hold of fresh too. Fish Lady surprised me yesterday with some beautiful (and huge) fillets of cod. Perfect for lunch in the garden. Often cod or bacalao is served over patatas a lo pobre here (slowly braised in olive oil) but it was too hot to stand over a pan of hot oil and my waistline, I knew, would thank me for cooking the potatoes another way. The oven was on as I was baking bread, wisely I was keeping cool outside. I decided to cook the potatoes in the bottom of the hot oven and then to cook the cod in my griddle pan at the last minute. Mix the potatoes, peppers and onions with the oil and season. Put into a deep ovenproof dish, pour over the stock and cover tightly with foil (or a lid). Cook on high for about 40 minutes and then for 20 minutes with the foil removed. 10 minutes before the potatoes are ready, heat a griddle pan until smoking hot and then cook the cod filler starting with the skin side down. A couple of minutes on each side is probably fine, depending on how thick they are. Serve the cod on top of the potatoes with some fresh lemon. I also had a bowl of home made tomato sauce which we spooned over the top. Filling but not too heavy, and only a few minutes spent in the hot kitchen….perfect! Yes, it´s that runner bean time of year here Up the Mountain. We´re picking them daily, freezing some, giving some away and of course, eating plenty. This was a light supper dish that was quickly pulled together as I had already blanched the beans and had some cooked potatoes in the fridge (a staple in our house for potato based salads) and some cooked prawns. If you don´t have these ready though, it´s not the work of hours to blanch some beans and boil some potatoes before throwing in raw prawns to cook through at the end. Into a deep, heavy frying pan pour a few tablespoons of oil for frying and quickly fry the potatoes until they start to brown over a high heat. Reduce the heat to low and add the ginger, garlic, cumin and pimentón and fry gently until the garlic and ginger have softened. Now add the beans and continue to fry gently until they have cooked through. Add the prawns (I chopped mine as they were quite large) and taste. Add salt if necessary. This would be great with some finely chopped coriander but I didn´t have any. Serve hot with crusty bread or try this beautiful recipe for pita bread from Tandy over at Lavender and Lime. So, regular readers of this blog (and I thank you!) will know that here in Andalucía we tend not to waste much when it comes to food. All the unsual bits get used from the meat we eat, and even our broad beans shells, when they´re young and tender, get used in tortillas, scrambled eggs and cooked with jamon. Another Andalucían dish using broad beans is called Cazulea de Habas which translates as a broad bean stew. As ever, I asked around for recipes and this time I tended to get pretty much the same replies from everyone. An exceedingly simple and humble dish. Well, a little dull if I´m being truly honest, but that is just my opinion. I asked Big Man if he was sure he wanted me to make it, as it had been his idea in the first place. Well, he said, maybe you can give it a little Chica Andaluza touch to make it more exciting. So I did. It´s still a simple and humble dish, but with some nice flavours going on and more filling than its ancestor. I also have some suggestions for making it your own, so here goes. Put the bean shells, onion, mint and bay leaf in a pot and cover well with water. Boil until the shells are really tender (this can take about 30 minutes, so be patient). About 20 minutes into the cooking add the potato. Meanwhile fry the garlic and almonds until browned, put into a blender jug. Now fry the slice of bread on both sides until browned and also add to the blender jug. Add the saffron and pimentón and a large ladleful of the cooking water from the beans. Blend (I use a stick blender) until you have a smooth sauce. Add to the beans and season. I found it needed quite a lot of salt. Now, you´re done! However, you could serve it with a softly poached egg on top or some pieces of grilled chorizo or morcilla (blood pudding), although it will obviously no longer be a vegetarian dish. It´s a simple dish, but a lovely starter using seasonal vegetables or with a few additions could be a hearty main dish for two. Big Man approved the changes, and we agreed that the Chica Andaluza version was much more tasty than the original! A recent tidy up of my cookery books turned up two Indian books by Anjum Anand which I had hardly read. Time to put that right I thought, and next thing I was in the butcher´s shop ordering pork mince. Of course, pork would not typically be a meat used in most Indian curries for religious reasons, but this would be great with any other meat. For a fantastic recipe using minced beef, check out Frugal´s gorgeous Beef Kofta Curry recipe. As ever, I had to make a few small changes, but not too many. I had no fresh coriander so substituted dried, ground coriander and the same went for fresh ginger. We can get it here, I just didn´t have any to hand and when the craving for curry strikes, you have to go with it! This recipe is adapted from Indian Food Made Easy. Mix all the ingredients for the meatballs together plus 3 tbs of the onion you have chopped for the sauce. Heat the oil in a deep pan, add the bay leaves, cinnamon and remaining onion and fry until the onion is golden brown. Add the tomatoes, ginger and garlic and cook gently for about 8 mins then add 200ml of water and cook until thickened. Add the spices and salt and any remaining water (I didn´t add much as I continued cooking with a lid on my pan) and simmer. Meanwhile roll the meat into walnut sized balls and drop them into the sauce. Cover and simmer, turning the meatballs gently half way through, for about 20 minutes. Add the coriander and serve with rice, naan bread, popadums…however you like. We ate ours with my Sort of Saag Aloo made with the first of our spinach which is now ready to eat. This was a warm but not too hot curry with the lovely flavours of cinnamon and ginger, definitely one to make again. I can´t believe that I haven´t posted my version of this Spanish classic. Probably one of the most famous tapas dishes in Spain, simple, economical and delicious. Can be served hot or cold. There is always a great debate about how to cut the potatoes. Ask 5 people and you´ll get five different answers – the choice is yours. Put the potatoes (and onion if using) into a deep frying pan with straight sides if possible. This helps with turning the tortilla. Choose the size of pan according to how many people you are cooking for – you want the tortilla to be deep, so a smaller diameter and a larger depth works well. Cover with plenty of olive oil (this can be drained and reused) and use a low heat to braise the potatoes until they are tender, turning them over gently a few times during cooking. Drain the potatoes and save the oil. In a large bowl beat the eggs and milk together and if you want a thicker, spongy texture to your tortilla, add the cornflour to a little of the milk then mix in with the eggs. Season with salt then add the potatoes to the eggs and mix gently. The secret to a successful tortilla, I´ve found, is to have a high quantity of “filling” in relation to egg. The egg binds the potatoes (or whatever vegetable you choose to use) together. Pour a little oil into your frying pan and when it is hot, turn the heat down low, add the eggs and potatoes and cover with a lid. This now needs to cook very, very slowly until it sets in the middle and the bottom starts to brown. Turn the tortilla using a large plate and then slide the uncooked side into the pan. Timings will depend on how large your tortilla is. If you are unsure about flipping the tortilla, pop the frying pan under a hot grill for a few moments to completely set the top, then flip it. Once it is browned nicely on both sides, turn out onto a plate and enjoy it hot or cold. For a less authentic but less calorific version of this dish, use potatoes cooked in their skins. Peel and slice or cut into chunks and then warm them through in a very little oil before adding to your egg. I use this method more often than the “oil braising” method to help in the waistline war, and no one has noticed the difference! For another version, take a look at my Potato and Brocolli Tortilla here.